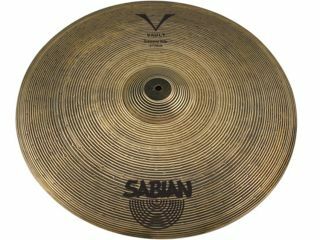 The sound wizards at Sabian have introduced the Vault Crossover Ride, an all-new 21-inch versatile cymbal featuring a modern jazz design that is intended to be responsive yet controllable. Combining vintage darkness and modern response concepts, the Crossover Ride is a medium-thin model with a medium-size bell, plus lathing and hammering combinations on its top and bottom surfaces. The tone is said to be warm, semi-dark and very musical, while the ability to ride and crash with total stick articulation means even the most complex sticking patterns can be played - and heard - at all times. The single-line lathing on its top surface even gives this model a look that hints at its sound: darkness and brightness combined to create a rich tonal color in a cymbal one can ride, accent, and crash in virtually any style of music. The Crossover Ride is made of B20 Bronze and is available in natural finish only. Retail price is $715.00US. Fore more information, visit the official Sabian website.